After having run Windows 7 on my netbook (Dell Mini10), because there weren’t good Linux support for the GMA500 graphics, I wanted to try it again. I found myself without any CDR or DVDR’s, so I had to do the install with a USB drive, luckily this is made easy with LinuxLive USB Creator. Just download the image of the Linux distribution you want and use the program to make a bootable USB stick. You can even enable a live mode that’ll let you try the OS without installing it to the harddrive. 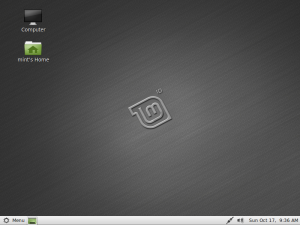 I choose to try out Linux Mint this time, having mainly used Ubuntu before (thanks to Brian). This entry was posted in Linux and tagged Dell, GMA500, Linux, Mini10, Mint, Ubuntu. Bookmark the permalink.